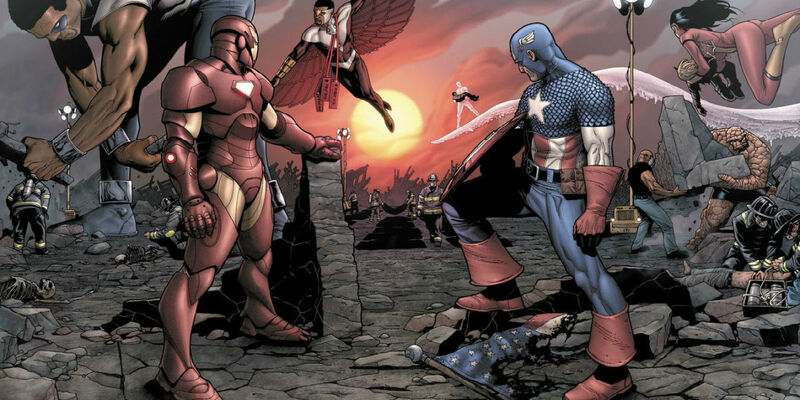 Rumor Patrol: 'Captain America: Civil War' Character Death Revealed? Now that Ant-Man has premiered, the second phase of Marvel's Cinematic Universe has officially come to an end, and next year will kick off Phase 3 with Captain America: Civil War. The third Captain America installment will see Steve Rogers (Chris Evans) face off against Tony Stark a.k.a. Iron Man (Robert Downey, Jr.), with new character T'Challa a.k.a. Black Panther (played by Chadwick Boseman) joining the conflict to provide a fresh perspective. The MCU teased Black Panther's arrival earlier this year in The Avengers: Age of Ultron, which introduced T'Challa's homeland of Wakanda and Ulysses Klaw (Andy Serkis), a major antagonist from the comics. However, T'Challa will be officially introduced in Civil War before starring in his own standalone film that is scheduled to premiere in 2018. Now, a new rumor may offer some hint as to T'Challa's character arc in Civil War. Heroic Hollywood is reporting that T'Chaka (T'Challa's father) will meet his demise in Captain America: Civil War, though offers little in terms of detail about the death, such as how or when it occurs. In the comics, T'Chaka is betrayed and murdered by Klaw for Wakanda's resource of vibranium, however it's unclear how closely Marvel will stick to the comics in regard to this storyline. As far as what we know about T'Chaka and T'Challa's roles in Captain America: Civil War, Marvel Studios head Kevin Feige seemed to indicate the elder Wakandan ruler would appear in the film. It seems T'Chaka will have already passed down his role as ruler of Wakanda and the mantle of the masked hero Black Panther (two positions that go hand in hand) to T'Challa and may be helping his son adjust to his new responsibilities and deal with the fallout of Age of Ultron. Additionally, it should be noted that neither T'Chaka nor Klaw have been officially announced as characters in Civil War. Serkis, when asked earlier this year if he would return for Black Panther, said he didn't know whether his character would appear. As for the role of T'Chaka, it was rumored Ernie Hudson (Once Upon a Time, Ghostbusters) was circling the part (shortly after Civil War began shooting), but was never confirmed to be officially cast as the Wakandan ruler. So, if T'Chaka were to appear in Civil War and be killed by Klaw, Marvel would need to keep both characters' involvement (including the casting of T'Chaka) under wraps. It's certainly not out of the realm of possibility, and since Boseman's T'Challa has already been confirmed to be a major aspect of Civil War, the death of his father would prove to be a pivotal point in his character arc throughout the movie - perhaps similar to Phil Coulson's (Clark Gregg) death in The Avengers. That being said, T'Chaka has not been confirmed to appear in the Phase 3 launchpad; off-screen mentorship could account for Feige's comments about Black Panther's involvement in Civil War. However, this character death was largely expected to occur at some point in the MCU, it just seemed to be a matter of when. In Captain America: Civil War, it may give T'Challa a compelling character story, though whether T’Chaka’s death will occur remains to be seen. Next: How Does Black Panther Fit Into Captain America: Civil War? Ant-Man is in theaters now; Captain America: Civil War releases on May 6, 2016; Doctor Strange – November 4, 2016; Guardians of the Galaxy 2 – May 5, 2017; Spider-Man reboot – July 28, 2017; Thor: Ragnarok – November 3, 2017; The Avengers: Infinity War Part 1 – May 4, 2018; Black Panther – July 6, 2018; Captain Marvel – November 2, 2018; The Avengers: Infinity War Part 2 – May 3, 2019; Inhumans – July 12, 2019.